Later that afternoon we decide to go for a ride and blow away the cobwebs. But pulling away the dust cover we realise that, alas, ‘twas not to happen, as the Silver STeed has clearly been host to some furry rodent visitors during the winter months and the little buggers have nibbled through some of the electrical wiring. Indeed, them hated mieces chewed some of the vital stuff to pieces. Ho-hum .. mustn’t worry too much as it can all be fixed-up .. that is, if you know what you’re doing in this field .. 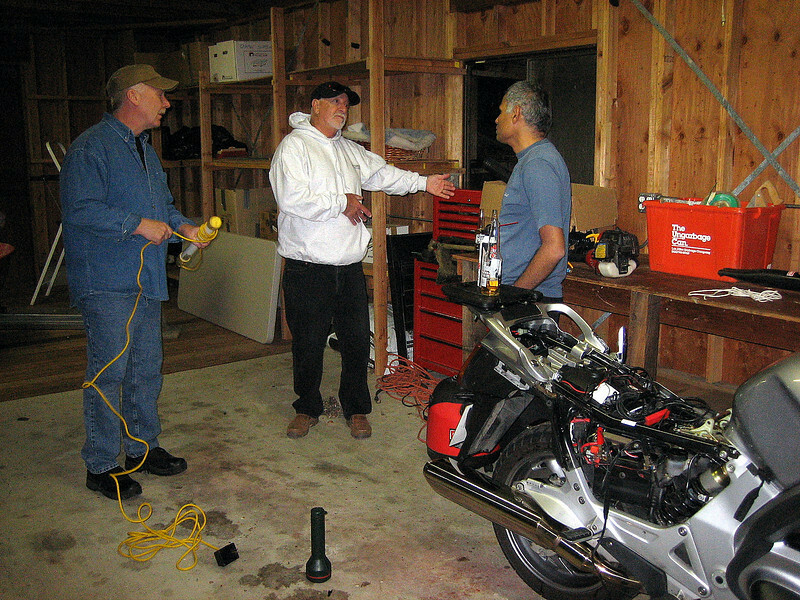 BUT fortunately for me, fellow ST rider, Richard, one of Vijay & Mo’s evening dinner guests, is handy with a soldering iron, and after some discussion, laced with a few premium-strength beers .. Furthermore, I am generously gifted a 12v compressor tyre pump from Vijay’s second ST-owning evening dinner guest, Don. Thanks again Don.